A recent article by Michael Estrin in iMediaConnection asks whether social media has lost its luster from an advertising standpoint. Traffic and usage of the major social networks continues to soar, with traffic to Facebook and Linked In up considerably in the past 30 days. In fact, LinkedIn which is considered to be the least social of the social networks but the most popular among more seasoned business users, is up 187% year-over-year. However, based on Estrin’s article, online media buyers are increasingly shunning social networks even though their audiences are huge and impressions are plentiful. Pack Mentality, or Performance Issue? For some media buyers, this poo-pooing of social media ad buys could be a herd effect. “people are saying social media isn’t a good buy, so I’m not buying it.” For other online media types – including yours truly – there’s another fact at work…. I have personally supervised the purchase of many ads on MySpace and Facebook, and the performance of those ads has been consistently terrible when compared to the same ads targeting the same people running on different sites. I believe there are 3 reasons why this is true. Have you really looked at a social network page lately from an advertiser standpoint? It’s just an absolute mess. 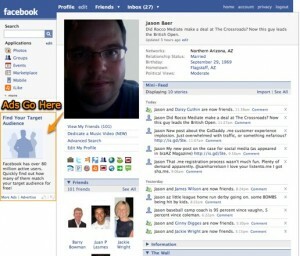 Facebook encourages users to cram as many applications and widgets as possible onto their profile pages, making for significant tunnel vision. Who can even notice the banner, when you’re being invited to play “Can you Name This Candy Bar” by a long-lost high school flame? Not to mention the fact that the Facebook “banner” format is not really a banner at all, but a text-heavy, seemingly contextual ad that purports to serve up relevant offers based on your profile data. However, I seem to get an ad for liposuction every third visit, which while debatably necessary, doesn’t endure me to Facebook (nor to my Wii Fit which give me the “you’re obese” message when I log on – I love being ridiculed by my gaming system). So, considering you can’t do anything remotely creative within the Facebook ad area, is it any wonder that the ads don’t pull? Why can’t Facebook use IAB standard ad formats like everyone else? The second issue is the inability to determine if an ad is actually an ad. This is the biggest problem with MySpace, which has page layout regulations approximately equal to Chinese air quality standards. Lax, at best. As the screen shot below for Paris Hilton Zombie demonstrates, the folks at University of Phoenix are not likely to be getting a lot of solid eyeballs on their banner, which even if it sprayed acid out of the computer monitor would be less arresting than the rest of the page. The success of the social networks in attracting huge audiences that pile up the page views actually hurts the sites from an advertising perspective. To even remotely fill their massive inventory, these sites are accepting run-of-site, low CPM deals as long as the advertiser meets a minimum overall spend ($10k+ in most instances). As a result, the ads you see on these sites (especially MySpace) are frequently mismatched with their viewers. Considering heavy social network users view 30+ pages per visit, it takes about 2 visits to realize that most of the ads on the site are not targeted, nor relevant, therefore why bother paying them any attention? Imagine if every Super Bowl commercial was for discount embalming services. By halftime, you’d be ready to tune out. While this trend is perhaps most egregious on these sites due to their millions of page views per hour, the explosion of ad inventory online is an industry-wide problem. I don’t blame sites for trying to monetize their content, even if it’s at $1 per thousand impressions, but the subsequent lack of ad relevancy trains users that banner ads usually don’t have anything interesting to say, and that hurts all advertisers. The media buyers that are still buying social network ads are contributing to the problem by not implementing impression or frequency caps. I saw the same University of Phoenix ad about 9 times in a row on MySpace. That’s not an efficient or smart media purchase. If you’ve got examples of good (or bad) social network advertising, leave a comment.